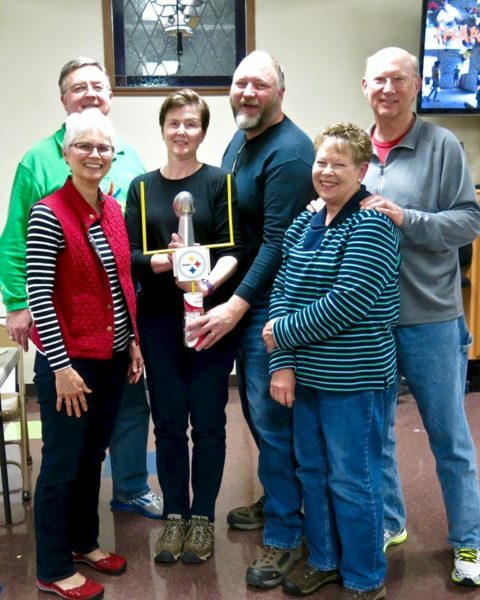 Introducing the Faith Lutheran Church 2016 Guatemala Trivia Night champions representing the Pittsburgh Steelers: Tony Alter, Debbie Alter,Sara Lynn Hartman, Phil Hartman, Jeanelle Mooney and Rick Mooney. Victors by one point over the Green Bay Packers due to the only category sweeps of the evening in History and Science & Nature. I think it was entirely due to my knowing that Israel offered its presidency to Albert Einstein in 1952. Or perhaps Rick knowing that floods are the leading cause of death by severe weather. Or Phil knowing that Greenland is a province of Denmark. Whatever, we are an awesome team! Go Steelers!